You are finally fed up with your creaking and slow Windows PC (Personal Computer) or laptop. What do you do? Well one option is to do a full Windows reset. 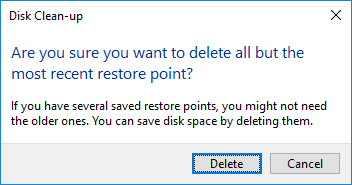 This is the most drastic, but the most effective, way of clearing out the bloatware and file clutter. But before you go and reinstall software, apps and data after the reset, take a moment to clear out redundant files. Removing the reset Windows redundant install files will shirink initial Windows disk usage, allowing more space on the hard drive for your data. This is especially important if your Windows hard drive is a low capacity SSD (Solid State Drive). A fresh install of Windows, or a Windows Reset this PC is the most effective way to answer the question: How do I free up space on my hard drive? Especially if you use the option to NOT to keep the data files. BUT PLEASE ALWAYS KEEP BACKUPS OF YOUR DATA. Backing up data is easy these days with services like Microsoft OneDrive, Google Drive or Dropbox. These services can sync data to Internet cloud based servers automatically. Alternatively use a USB stick (thumb) drive or external drive for backups (but keep it somewhere safe). 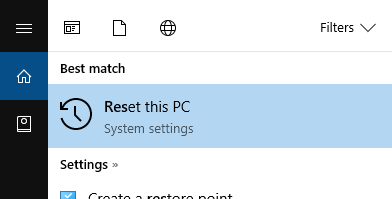 To do the Reset this PC type res into the Windows search box. Click the Reset this PC option, then Get Started and follow the instructions. How much hard disk space does Windows use? In Control Panel select Uninstall a program. If you spot anything that is not needed uninstall it. E.g. a NVIDIA 3D Vision Driver if you don't use 3D hardware. Type apps in the search bar to find Apps and features in settings. Delete any unwanted apps, e.g. remove the Xbox app from Windows if you are not interested in Windows gaming. Note uninstalling apps for one user does not remove them for other users. 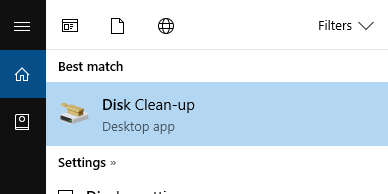 Type dis into the search box and choose Disk Clean-up. Choose the Windows drive. Usually the C: drive. Once the initial clean-up is done run Disk Clean-up again for advanced cleaning. 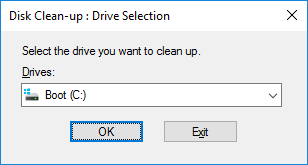 Click the Clean up system files option and choose the Windows drive again. Disk Clean-up will scan for more files. This will allow more space to be recovered, e.g. files from previous Windows installations. If unsure of checking an option to clean then leave it at the default. Under the system files option the More options tab becomes available. On this tab click the Clean up for System Restore and Shadow Copies. This is going even deeper into cleaning the Windows system. Optionally install a computer cleaning utility such as the Piriform CCleaner. These utilities are useful, but be aware that there are fake cleaning utilities around. Always research to ensure that a third-party utility is offical and does the correct job. At Tek Eye the Piriform Utilities are used, always download or buy from their website to ensure the legitimate up-to-date versions are used. On the example PC once the above deep clean was done, the disk space being used fell from 31 GB to 17 GB. That is a big saving and could make a difference if Windows is installed on a small 64 GB SSD. Plus the Windows reset should see the system run faster. Now would be a good time to take a disk image of Windows in case the hard drive ever failed. Using an external hard disk and software like Acronis True Image is insurance against hardware failure. Finally if you are running Windows under an administrator account, i.e. you are effectively running your daily activity in god mode, set up a local, a.k.a standard, user account. It is safer to do day-to-day work without being logged in as a Windows administrator. Backup any data that must be kept. Use the Windows Reset my PC to perform a fresh Windows install. Use all Disk Clean-up app options to remove left over Windows files. Delete anything remaining in C:\Windows\Temp. On the example PC this was procedure was performed and the post Windows install disk space fell from 31 GB to 17 GB.